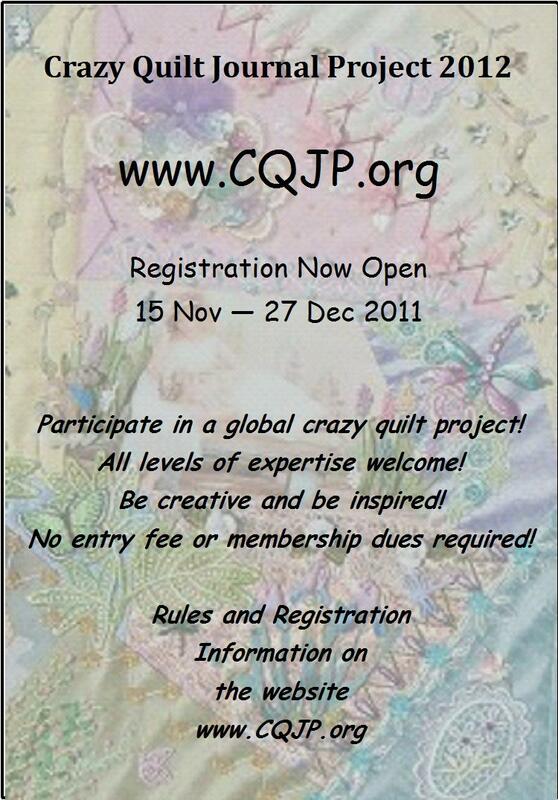 Crazy Quilters, Please Join Us!! The Crazy Quilt Journal Project is an annual challenge issued to all needle-artists to produce a major crazy quilt project within the established twelve month period. -- To increase awareness of crazy quilting at the local, national, and international levels. -- To challenge crazy quilter's to continually expand their creativity and improve their individual technical skills. -- To inspire, and encourage crazy quilter's through publication of our individual works in a consolidated and inter-active web-based format. -- To provide a central location for the public to view examples of crazy quilt projects in progress and completed. Visit the CQJP Blog and register today!! Our Honorary Chairman is none other than J. Marsha Michler, well known crazy quilter and author of many CQ and other books. Visit her website here. 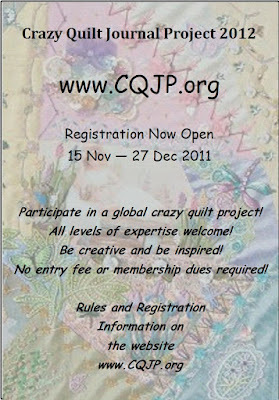 We hope you will join us in this, the largest CQ project for 2012! Let’s work together to show the world our beautiful art! I was catching up on my blogs yesterday and came across this. I am excited about this and ready to join!